Description: Rhizome short-creeping, the apex covered with narrow dark brown scales. 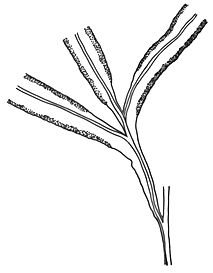 Fronds erect, 100–200 cm high, 1-pinnatifid to incompletely 2-pinnate, dark green, not markedly dimorphic; stipe pale to red-brown, to over 30 cm long, rachis brown; pinnae glabrous, primary pinnae increasing in size towards base of frond; lowermost primary pinnae 10–30 cm long, segments linear-lanceolate, the margins minutely toothed on sterile fronds or entire. Distribution and occurrence: in rainforest, often forming large colonies in shaded situations.